Sometimes commodity networking products are simply not enough to solve a specific problem. In these situations, flexibility, programmability and performance are of the highest concerns. For high density situations, the ExaLINK Fusion and ExaNIC V5P firmware development kits (FDKs) are the perfect solutions. The Fusion FDK opens the ExaLINK Fusion and ExaNIC V5P FPGAs (Xilinx KU115 / VU5P) to be fully programmable. It includes our industry leading low-latency MAC/PCS IP blocks as well as memory controllers for onboard DDR and QDR memories and an optional high stability clocking. The ExaLINK Fusion FPGA can optionally be connected to the ExaLINK Fusion x86 module, which is a fully user accessible 4 core (8 thread) Intel Skylake CPU that clocks at up 3.5Ghz. The module also includes both NVME and M.2 SSD disks onboard as well as a user accessible and programmable ExaNIC x40. 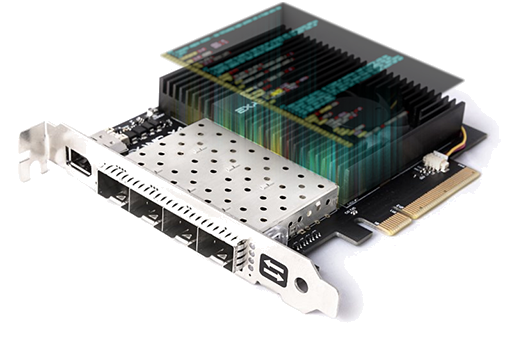 For low to medium density applications, Exablaze provides the ExaNIC X4, X10, and X40 FPGA programmable network application platforms. The devices provide 2, 4 or 8 ports in SFP+ and QSFP form factors. The half-length cards can be installed in any production server and are easily configurable and manageable using standard tools. The ExaNIC firmware development kit (FDK) also includes our industry leading low-latency MAC/PCS and PCIe IP blocks and an intuitive single clock domain interface for fast, bug free code. Our own ExaNIC FW product was developed using these tools.